BentoLunch.net - What's for lunch at our house: New Boxes! It's always fun to go shopping and find something you didn't even know you were looking for! In my world, that usually means I find a bento box, or two, or ten. 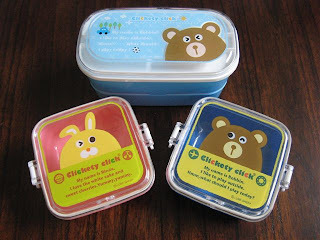 I got each of the kids a mini Clickety Click box with a snap down lid. It's really more of a bento snack box than a bento lunch box. I plan to use Ben's for his snack tomorrow, so I'll see how much food I can fit into it. What I really want are picks that I keep seeing online and on Ebay. One of these days, I'm going to need a shopping trip to California. What picks are you looking for? I just got back from California and I brought back a ton of bento goodies! I have several different types of picks - email me if you are interested! Avie, thank you so much! I will email you the ones I am thinking of. I'll be glad to pay for them, it just kills me to see $3-5 online and then another $5 for shipping. 1) Where is this store you went to? I want more boxes for Mac. I live in the Bay Area and would be happy to look around for you. Just let me know what you want from the area or where to go. I love your site by the way and just started using a lot of the recipes for my toddler. Which stores are you finding these at? I also live in the Bay Area. I found some at Matsuwa but not as cute as these!